What message would you send to Dom Manfredi? Robert Kenyon: Keep your chin up, it will be very difficult over the next few months and you will feel really low but you will know best how to deal with it mentally, get well soon. Although you may not think it, because you have spent time out of the team over the last few years, you are one of the toughest and most exiting players I’ve watched play for Wigan in my nearly 30 years of watching. But probably the worst at interviews, only joking. During your time out over the past few years I’ve longed for you to return as I really want to watch you against the Aussies, you’d cause them massive problems. If you got a decent run in the team you are a possible Man of Steel winner, 100 per cent and even though you’ve just got injured I can’t wait for you to return. Jon Lyon: There are barely words, what he must be going through is unimaginable. All I can say is there is hope. After the initial shock and anguish, he can look to several players such as Adrian Lam and Brent Tate who have come back from such a serious knee injury three times over. The fans of all rugby clubs are feeling for Dom right now and the club and sport as a whole will provide all the support he needs, physically and mentally. I hope the memories and emotions from the Grand Final last year will provide the inspiration Dom needs to fight back from this again, knowing the highs that can await. 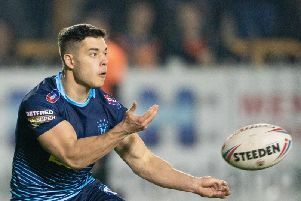 Darren Wrudd: Poor Dom, he has certainly had his share of misfortune on the injury front and this latest test of his resolve is not going to be easy for him. I would however like to point out to him, even though I know it will have been said many times already that we as a club, that’s staff, players and supporters are all behind him and wish him the very best of luck with his operation and rehab thereafter. Dom, you are one of the most exciting players that this club has produced and we love seeing you in our shirt, keep the faith as we are not the same without you and will look forward to the day that we can cheer you back onto the field again. Sean Lawless: What has happened to Dom Manfredi is absolutely heartbreaking and devastating, I cannot imagine what he and his family are going through. Wigan are a great club for supporting people and I am sure they will do well by Dom and his family. My message to him is simply keep your chin up, forget about the aim of getting back on a rugby pitch at this moment in time; target the small things and enjoy them. Whatever comes in the future, he will always be a Wigan hero and the 2018 Grand Final will always be remembered as his. Broadly speaking, are doping bans – typically 14-months to two years – a big enough deterrent? Robert Kenyon: No. Not when teams (including us) are signing these players to play once their bans are up. The ban is akin to being out with an injury, it isn’t enough. The problem for me is much deeper, it’s a an epidemic in society that needs addressing but we can only control what happens within our sport. I’d say that if you test positive for drugs then you cannot again play representative rugby for county, country ever again etc. You are exempt from winning any individual awards and all previous individual awards given should be taken off you and given to the runner up eg ‘Man of Steel’. Any records such as tries in a season etc will be taken off you and given to next in line. Etc all this on top of a minimum four-year ban. Jeanette Lusher: I have very little knowledge regarding drugs and banned substances so my opinion is based on ignorance. Simply put, I feel that if a performance enhancing drug is used then the ban should be career ending but if it is a recreational substance such as cocaine then the 14-months to two-years should be sufficient. However I would not tolerate repeat offenders and would have no qualms implementing a career ending ban in such an instance. The drugs are readily available out there but each player has a duty to resist the temptation for his own wellbeing, his club’s wellbeing and the wellbeing of his supporters. Jon Lyon: It would appear not. Knowing players can be randomly selected for testing, I cannot understand why a player would risk so much for so little. Don’t do it at all, but if you are stupid enough to then at least wait until your career is over. Doubling the ban may be worth considering, or huge fines that would seriously impact a player’s ability to support their family. Ultimately we want a clean sport, and the punishments should be as high as is needed to attain that. An instant life ban may seem very harsh but you would hope that as a deterrent it would do the job. Darren Wrudd: I don’t think the ban however long it was would be a deterrent to some. They would always find the reason to take a drug, never thinking that you would be caught out. Some people are just wired that way and will take the chance no matter what the consequences. It is only later, when a career ending ban forces them to look at what they had lost that most would consider how lucky they had been in the first place. Perhaps recreational drugs are dealt with correctly as this gives a chance for rehabilitation and rebuilding a reputation after a stupid decision, but performance enhancing drugs should carry a life ban. If you cheat at sport, then you should not be allowed to compete again. Sean Lawless: Looking at the regularity of doping bans in rugby league at the moment, you would think that the bans aren’t working as a deterrent. However I think the ban has to be edged with the ability for a sportsperson to be able to get back to their profession and achieve, if they can. The culture within our sport in particular at the moment for this isn’t great and I wonder whether it’s the sport that needs to provide more education.